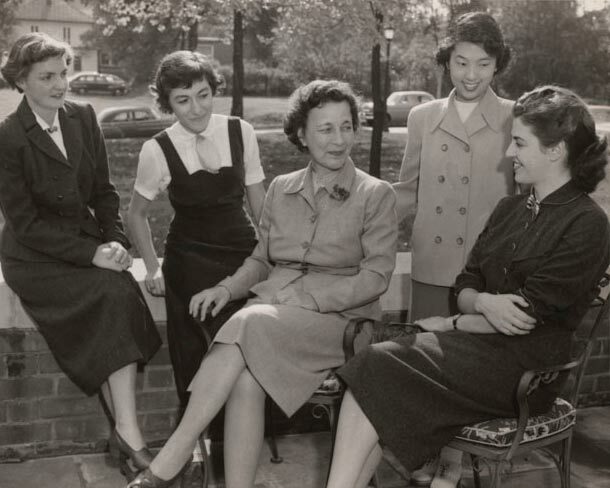 In the mid-‘60s, members of the Virginia General Assembly and several state commissions encouraged the University to consider full coeducation. 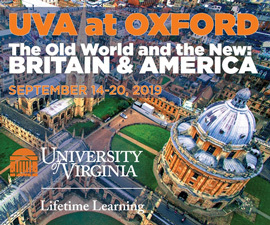 African Americans had fought for access to the University and, starting in the late 1950s, UVA had begun admitting small numbers of African-American students. In early 1969, the Board of Visitors voted to gradually provide greater access for women to all parts of the University. During a transitional period of one year, they planned to admit the qualified wives and daughters of staff members. The University proposed increasing the number of female students over 10 years and capping their number at 35 percent. Mere months later, four women—Virginia Anne Scott, Nancy Jaffe, Nancy L. Anderson and Jo Anne Kirstein—represented by American Civil Liberties Union lawyer John Lowe (Law ‘67) brought a lawsuit against the University. The plaintiffs claimed that the University “severely discriminates against women in their admissions policies” and petitioned for the College to admit women. The court mandated full coeducation within three years. The court also granted the plaintiffs a temporary injunction to study in the College of Arts & Sciences in the fall of 1969 rather than having to wait an additional year. Virginia Anne Scott enrolled that semester. 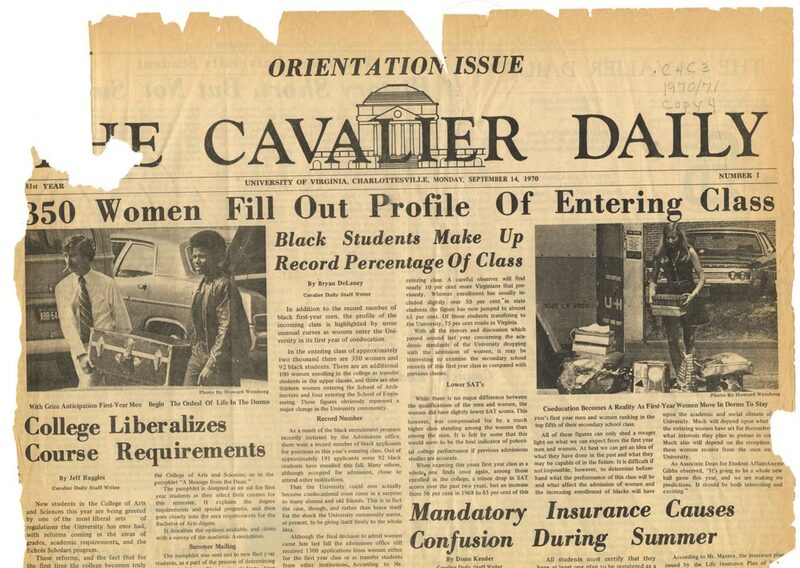 In September 1970, 450 undergraduate women, 350 of whom were first-years, entered the College. Ernest Ern, admission dean during those transitional years, was quoted as saying that the Office of Admission intentionally selected exceedingly strong women who displayed academic, leadership and social promise. In 1971, 550 new female students arrived on Grounds. The fall of 1972, students were admitted without regard to gender. 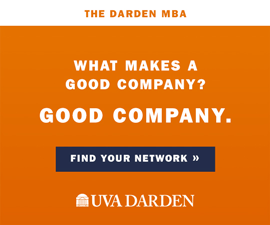 These women gained entry into UVA’s organizations, societies and leadership positions, including the IMPs, the Raven Society, the Cavalier Daily and the Honor Committee. 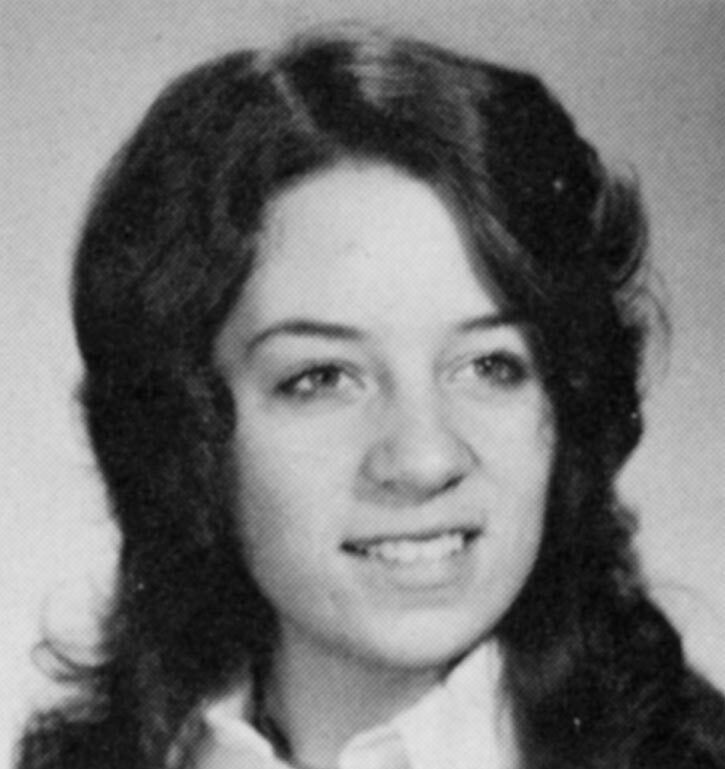 In 1972, Cynthia Goodrich Kuhn (Col ‘73) moved into 28 East Lawn and became the first female Lawn resident. 1921: Adelaide Simpson becomes first dean of women. 1921: The Women Students Self-Government Association is created. 1927: Mary Jeffcott Hamblin becomes dean of women. 1928: The Co-Ed Room on the West Range provides a women-only space to gather for meals or other social events. 1934: Roberta Hollingsworth (Grad ‘33) becomes dean of women. 1951: Mary Munford Hall is the first dormitory built specifically for women. 1967: Mary Whitney becomes dean of women. 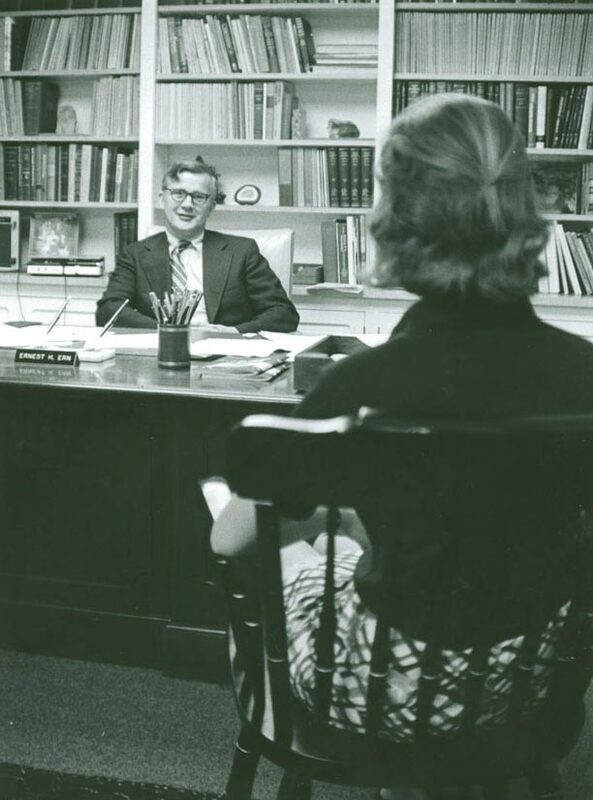 1970: Annette Gibbs, associate dean of student affairs, helps with the transition to full coeducation.